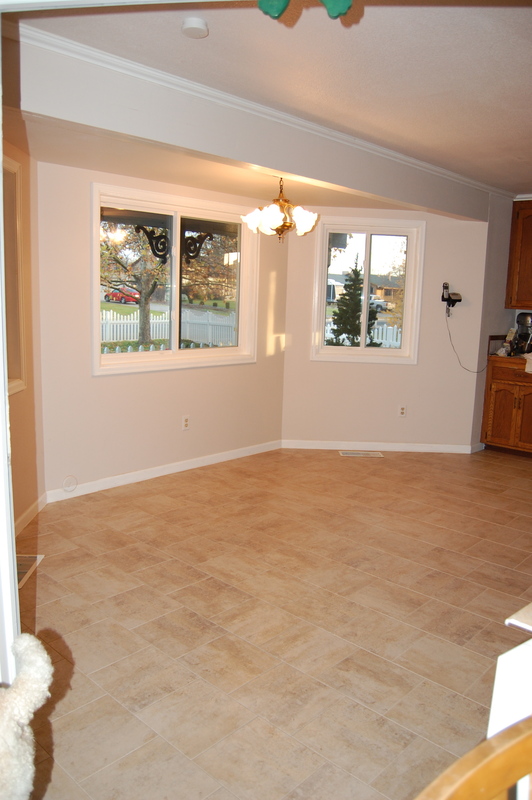 Kitchen – Phase 2 Renovation – The Floor!! 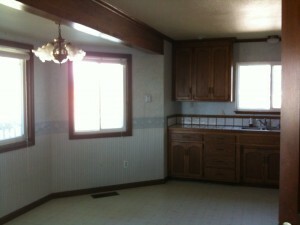 Ok…although we are UBER close to completion of phase 3 of this kitchen renovation, I MUST tell y’all about my floor. 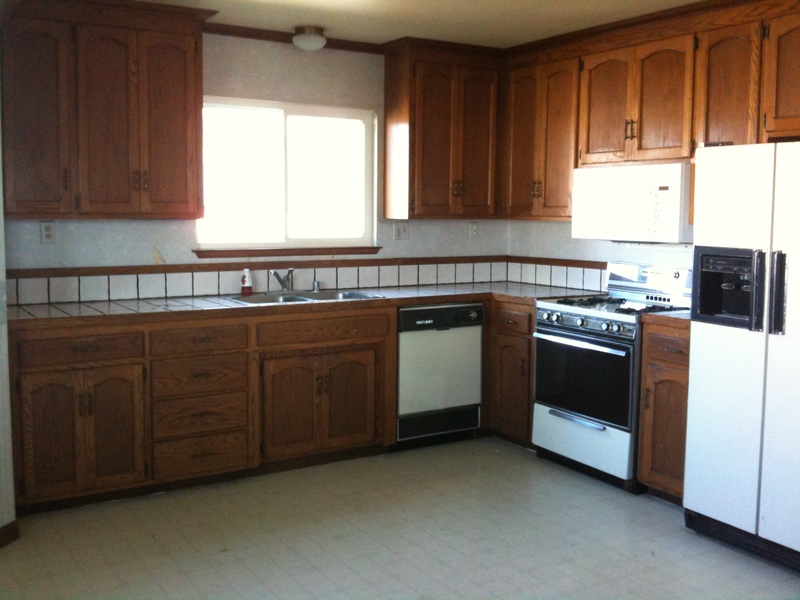 We had this old 80′s linoleum rockin the flooring in the kitchen. It looked swell agains the blue ribbon/flower wallpaper. Once the wallpaper was out the door, we knew we wanted a new floor. BUT we weren’t ready to invest in the hardwood flooring that we wanted, especially since we knew we were remodeling and didn’t know what the new layout would be. So….my mom was visiting and got a wild hair to put new flooring in the kitchen. She measured. Drew a little diagram. Drug me to Home Depot. She sat down with a flooring dude and starting working the numbers. She was about to drop about $1500 on NEW LINOLEUM. 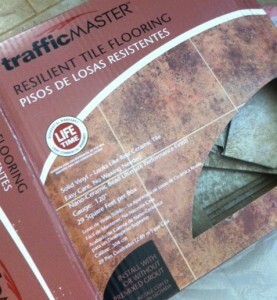 It is 12″ square vinyl tiles. That you can install with or without grout. The material cost just over $300. So, for a temporary floor, I am totally ok with this expense! All we had to do to prep the existing floor was run a sander over the linoleum. Yep, we lay this stuff right over the existing linoleum. I have never installed tile before, but hey, I don’t like to do things halfway, so I decided not only to install this MYSELF, but to not just do the traditional design. Installation was super easy. To cut the tiles all I needed was razor blade. I used the little tile spacers. I used pre-mixed grout. I just LOVE the finished product. I am so happy with this product that I am not even thinking about the wood flooring that I really wanted before. 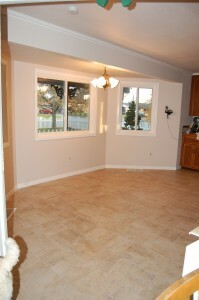 In fact, with my new cabinets that just got installed, this floor looks even better! I have had several construction related people over and they have all thought this was a real tile floor. In fact, at least 2 of them didn’t believe me so they had to kneel down and feel it! In 2 weeks, I should have a next to completely remodeled kitchen…. so stay tuned!